Caricature of late French president Charles De Gaulle. He is in French cavalry uniform from ww1 era. Low poly, rigged, animated game ready 3D character with PBR textures. Textures are 4K, optimized for Unity game engine. Rig is made for Unity mecanim. One custom animation as in 3d viewer is included. Included in pack: -Maya LT 2017 files with Rigged De Gaulle in T-pose, and animation as individual Maya file. 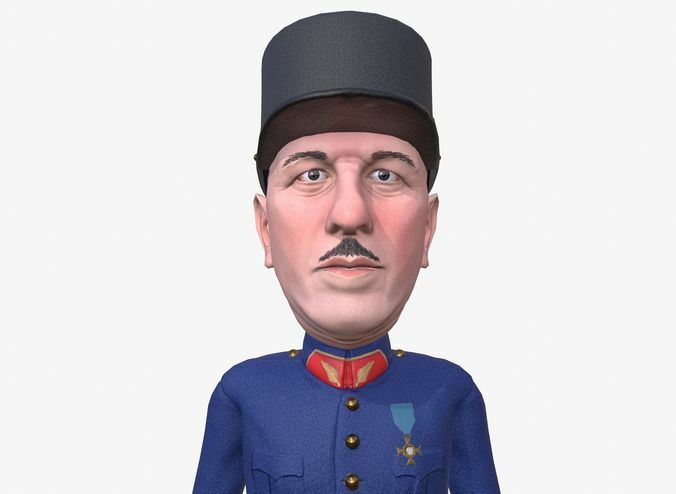 -FBX files with rigged T-posed De Gaulle and animation as individual FBX. FBX files are exported from Maya. -OBJ file in T-pose in case you want to rig him yourself. -Unity 2017.1.0f3 pack -Textures 4K in PNG format. Textures PBR: Color map, normal map, spec map. All textures are 4K. Can be reduced to 1K without significant loss of quality. Browse my store to see more caricatures i created.